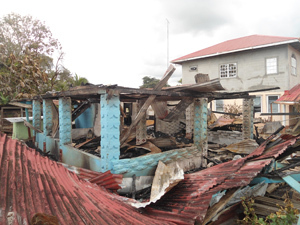 A fire ravaged the home of Shridevi Rajbar of lot 17, De Buff, Canal Number Two, West Bank Demerara (WBD), last Thursday evening. The blaze has left homeless, Rajbar along with her grandmother, Marianne Singh and two children. According to Rajbar, the fire started at about 19:15 hours, while Diwali festivities were under way. Rajbar related that she was unaware when exactly the fire started as she was busy lighting diyas with her two children. At this point, Rajbar said she rushed to the top floor to see whether she could have done anything to put out the flames. However, the inferno had escalated to an uncontrollable point, according to the woman. Residents of the area rushed to Rajbar’s aid in an effort to save her home. They formed a bucket brigade using water from the nearby canal, along with a water pump from another resident in the area. Their efforts were, however, futile as the fire quickly engulfed the entire top floor by the time the fire tender arrived on the scene. Rajbar said she was born and raised in the now razed home, until she migrated for work related reasons. Three years ago, she returned to her childhood home to raise her two children. The mother and her family are now staying in Wales, WBD with her sister.